I like this series of books by Ted Wood, especially the first four or five. I picked this one to read because of the winter setting, just right for this time of year. Reid Bennett is the one man (plus dog) police force for Murphy’s Harbor, a small town on a lake in Ontario, Canada. The first book in the series introduces him, tells of his background as a Marine in Viet Nam, his taking the job at Murphy’s Harbor and his first important case. It’s a good book, and I recommend it. This, the second in the series, follows up, and while that took place in Summer, now it’s a bitter Winter. The town, in an effort to pull some off=season tourists to the area is having a Winter Carnival, and part of that is a beauty contest. A blizzard has settled in, but the people are happy in the Legion Hall, and everything is fine until the beauty contest winner, disappears. There one minute, then the lights go off, and she’s gone the next, when the power is restored. At first it looks like a group called C.L.A.W (Canadian League of Angry Women) is responsible, but it also looks as if it’s just a publicity stunt and the girl will reappear the next day to fanfare and publicity for the feminist, anti-chauvinist group. Still, policeman Reid Bennett has to go find the girl, in the icy storm, 2 or 3 inches and hour falling, wind whipping. But the girl was taken out to the main highway, which had been plowed, and could be anywhere. Checking a motel not far away, Bennett finds the group, girl and “kidnappers” had been there. He finds the girls is willing and part of the disappearance, and he finds a dead woman in the room the group had rented before they left after a couple of hours. The girl’s father is head of a company which makes missile guidance systems, and soon we find he, and probably his daughter, are the target of a “political action committee” calling itself The People’s Revolutionary Guard. The PRG are ruthless, and before long another body is found and the action escalates. I’ll not say more, except that Bennett, on a snowmobile, is constantly on the chase, trying to close in on murderers in what at first seemed only a feminist publicity prank, now turned very deadly indeed. Let’s get this out of the way: this is a very good book, but it’s dated in some of it’s characterizations, motives and viewpoints. The portrayal of a militant feminist group is very Eighties, as is the set up of an anti-war political action group. Things were that way then, and when it was written it made perfect sense. It’s a case of written in it’s time, of it’s time. I enjoyed re-reading this enough that I’ll re-read another or several of these before I move on to other books. Good stuff. I did a Ted Wood book for FFB a few years ago. I enjoyed this series, and I liked the books he did as Jack Barnao, too. Wood really is forgotten, when he’s even on anyone’s radar at all. I haven’t read any of the Barnao books, but should. A new series for me – thanks Richard. I think you might enjoy these, Sergio, but note they are best read in order. 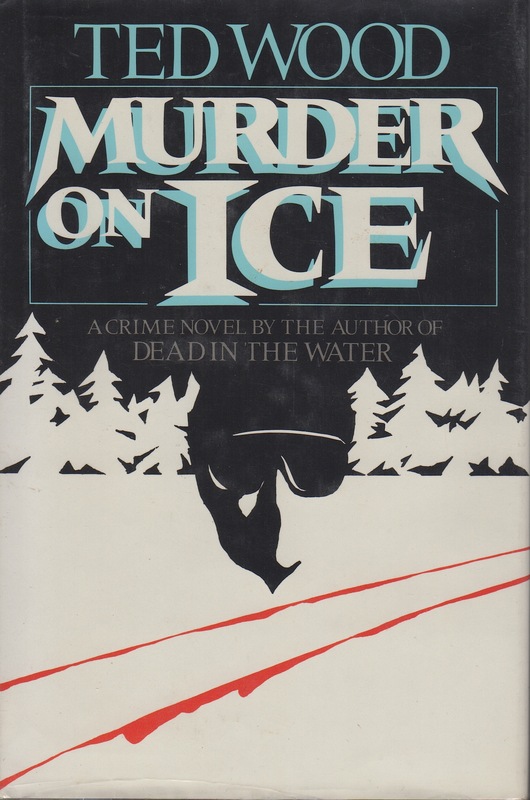 MURDER ON ICE is a great title! I think I might have this book but if I don’t I’ll track down a copy. Nice review! George, I think you commented way back in APA days that you’d read a couple of these. That happens, Charles, to me also. Something about this character kept me going on the series, though. I really liked the Ted Wood series when I discovered it 30 years ago, and quickly read the first 3-4. I caught up to book 9 by 1993, but the price for book 10, which hadn’t then been published in the States I believe, was prohibitive, like $200. I didn’t want to read it that much. Fast forward a couple of decades. Just as a lark I checked ABE for a copy of the last book, A CLEAN KILL, five years ago and there it was, an ex-lib copy but in nice dust jacket for $8. I bought it and read it (December 31, 2010), but can’t remember anything about it other than thinking like you, that it was dated by then. Still, I’m glad I got it. As for the Jack Barnao books, I read the first but never quite got around to the others. Has it been 30 years? Yes, I guess it has. I came across the first book, Dead In The Water, about that time, and got this one too, then continued buying them. About 10 years ago I had a chance to sell the set but decided I liked them enough that I wanted to keep them. Now I’ve re-read the first two and just may keep going. The 80’s were such a strange time. At any rate, I’ve never heard of this author and maybe I’ll take a look one of these days. I like the idea of a lone minion of the law policing in Canadian snow and cold. (But I’m not crazy about the ‘militant’ women aspect.) This book reminds me of another author, Steve Hamilton. He is a double Edgar winner and has written at least one book I consider brilliant: ‘BLOOD IS THE SKY’. Hamilton sets his books in the upper Michigan Peninsula near the Canadian border – lots of atmosphere, ice and snow and the lone hero, Alex McKnight, is a guy worth knowing. I think I’ve read something by Hamilton, but not that book. Or perhaps it was another Hamilton. This series begins with a book during the summer season, and the others are still various times of year. Just now downloaded Murder on Ice. You’re a good salesman! Hope you enjoy it, Matt.